Perfect as a gift for all Super Mario fans! 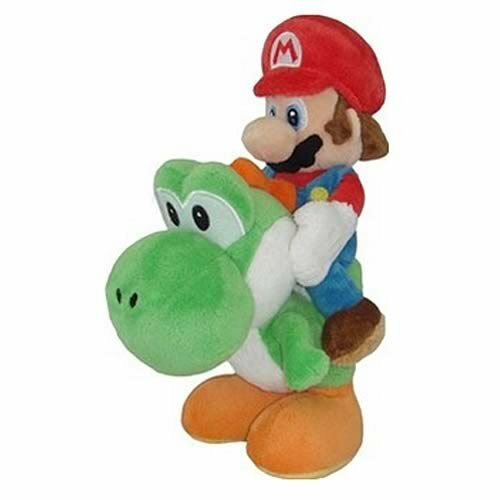 This Super Mario Mario Riding Yoshi plush toy is anofficial, licensed product made by Little Buddy. Little Buddy Super Marioplush toys are high-quality, well-made, and safe products. This item measuresapproximately 8 inches along the longest dimension. The UPC for this productis 819996012412. From the Manufacturer Mario is one of Nintendo's most popularcharacters who has been around since the start of home gaming. His firstapperance was in 1983 in Nintendo's Donkey Kong where he was out to rescue histhen girlfriend, Pauline. Whether you are a long time lover of Mario or youjust became familiar with him through Nintendo's release of the Nintendo Wii,there is no doubt that he is one tough little guy who is always ready to savethe day. And the Princess. The Mario plush measures about 8" tall and comesdressed in his signature Mario outfit.